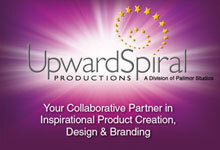 Upward Spiral Productions, created by The Spiritual Mall's co-founder Judi Paliungas, collaborates with various teachers, authors, coaches and entrepreneurs in the Human Potential industry in designing, creating and producing products, programs and services that bless and transform people's lives. Her years of experience in graphic design, website development, branding, marketing, production and product design position her and her team as a valuable resource in bringing high quality resources into tangible form. Products they have co-created include The Mracle Minute, Put a Zip In Your Day, Let My Soul Surrender, Angels Among Us Gifting Cards, Miracles & Blessings Jeweled Bookmarks, The Possibility Process Program and more.